Sunshine on My Shoulders – Maine. Ocean. Camping. It seems like I start every posting with a weather report…but today is picture perfect…85 degrees with a gentle, warm breeze…with enough rain yesterday to make all the plants look happy and healthy. As I write to you, I’m sitting on the back porch of the rec hall. 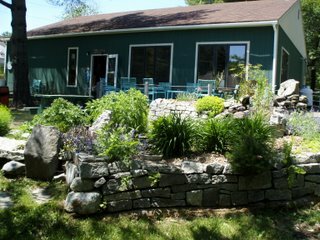 I can see the ocean through the trees and have the trickle of the waterfall garden for companionship. But what am I thinking, a picture is worth a 1000 words…I’m sitting on this back deck…laptop computers and cordless phones rock! After the seventh graders left last Thursday, Steve’s sister Suanne came up from Boston to visit for a few days…she is the ultimate organizer. She hadn’t been here two hours when she pulled my father into his office and made him sort, organize and throw away boxes worth of stuff…in four hours she un-did more than five years worth of tossing things in and closing the door quickly. As anyone who knows us well will attest, don’t ever offer to help around here if you don’t really mean it. 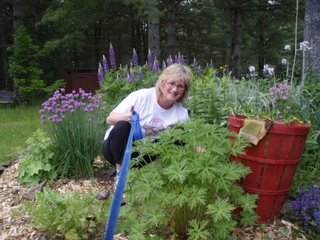 This is Su up to her elbows in the garden beside the 120 sites…in just a couple of weeks it became overrun with buttercups and pineapple weed…but this too she corrected. Friday I spent the day in Waterville at Colby College with the Maine Arts Commission. The morning program was devoted to the Commission’s current focus on New Media Art. After the presentations and lunch, we toured Colby’s Art Museum which is currently featuring the abstract work of Bernard Langais . Founded in 1959 and now comprising four wings, more than 5,000 works, and more than 27,000 square feet of exhibition space, the Colby College Museum of Art has built a significant permanent collection that specializes in American and contemporary art. If contemporary art is something you enjoy, then by all means plan to spend at least the morning enjoying these collections before you lunch along the Kenduskeag River. The drive is beautiful and a complete tour would be a pleasantly relaxed daytrip from the campground. To find out more about the art museum, visit http://www.colby.edu. Saturday we hosted a wedding down at the beach. 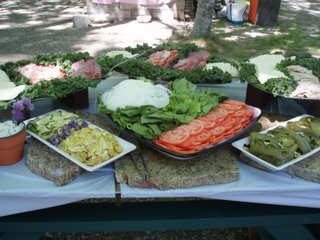 The bride’s requests were simple and elegant…an al fresco meal of roasted meats, marinated vegetables and a wide variety of cheeses. If you look closely at the roasted bell peppers, we garnished them with tiny chamomile blossoms…so pretty! 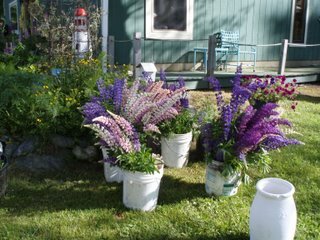 Mary, the mom, surprised the bride with a lupine theme carried through in the buckets of fresh lupine spread through the park. Kaylin picked them early Saturday morning from the fields near her home. 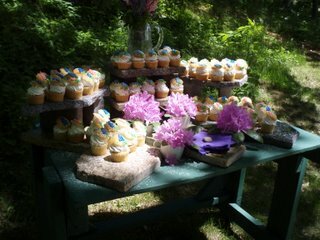 Lupines also garnished the luscious lemon cupcakes that Assunta made and displayed beautifully in the shade of the oak trees. 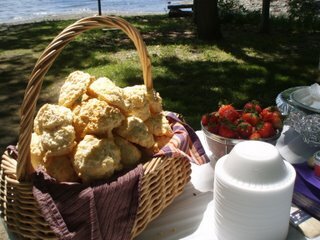 In my opinion the piece de resistance were the fresh strawberry shortcake with mounds of fresh, vanilla scented whipped cream…Martha Stewart eat your heart out! All this talk of food has left me famished…I think I’ll scavenge a bit of lunch for myself…the mesculun mix in the garden is ready to harvest and I think there’s a bit of crab meat left over from last night…bon appetite! I can’t WAIT to get there.. your blogs continue to call me North to your campground. We arrive soon !! And can’t wait to meet you and view the grounds.. Could you turn the temp down a bit.. I prefer high 70’s !!! See you soon !! Please continue your blogs !!! I look forward to new entries ! !